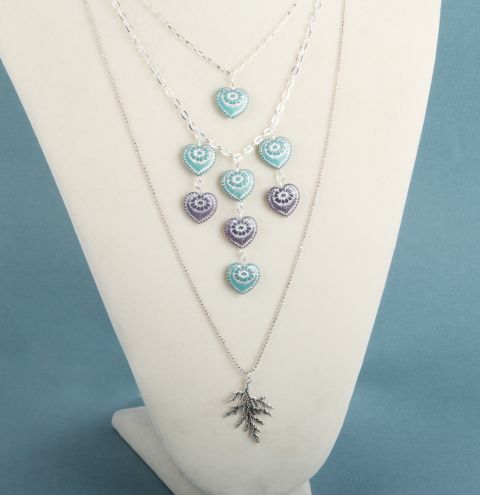 Learn how to make a trending layered necklace using new glass heart beads from Preciosa and a delicate evergreen leaf charm! Cut your oval link chain to 22 inches and attach a jumpring to each side and a loster clasp on one of them. Cut your rectangle chain to 18 inches and attach your clasp like before. Cut your ball chain 10 28 inches and attach the ball chain clasp to the end. Open a jumpring and link your leaf charm onto the ball chain. Thread a blue heart bead onto a headpin, make a loop and attach it to the middle of the 18 inch chain with a jumpring. Thread a blue heart onto an eyepin and make a loop. Thread a purple heart bead onto a headpin and make a loop. Attach the purple heart the blue one by opening the loops. Repeat to make a second pair. For the centre of your necklace link an eyepin looped blue heart to a purple one and then a blue one on a headpin at the bottom. Attach the longest set of beads to the middle of your chain and connect the other two either side about an inch away from the centre.